There are times when nothing will do but having food, now. These moments of low blood sugar usually end up with a bad decision being made. At least for the food-related mistakes that may happen in times of hunger there is hope. No longer do you have to suffer through a greasy fast-food meal or microwaved monstrosity simply because you don’t have the energy to make something good. The Sunbeam Rocket Grill is an interesting take on classic parchment cooking, Designed to keep food moist and flavorful by sealing in the juices, the Rocket Grill takes the concept one step further. By using ‘parchment pouches’ and vertical grill plates, fresh or frozen meats and vegetables are cooked while excess fat drips away. The fat is collected into a reservoir in the bottom of the pouch that is separated from the food. 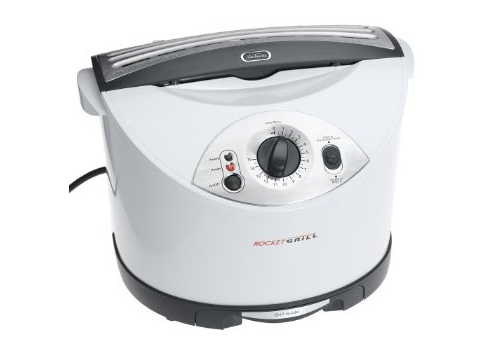 Operating like a toaster, simply place food in an included bag and then place upright in the grill. Food is prevented from drying out and is finished in a snap; most fresh food is done within 3 to 8 minutes, while frozen foods usually take from 8 to 12 minutes. Quick, easy and disaster-averting.